Her trainer, Fergal O'Brien, is 11 from 37 (29.7% SR) for 29.9pts (+80.7% ROI) with 10yr old chasers sent off at Evens to 9/1 since the start of 2013, from which Class 3 runners are 6/14 (42.9%) for 28.1pts (+200.8%). Jump Jockeys: How Are The Mighty Fallen? Perhaps more so than the terrific performances at Cheltenham this past weekend, or the death of National Hunt benefactor Alan Potts, jump racing's headlines have been hogged in recent days not by horses or owners, nor even trainers; but, rather, by the riders. First Paddy Brennan was sensationally 'jocked off' Cue Card, sweetheart of so many fans of the winter game, after a tumble too many; then Sam Twiston-Davies broke his elbow in a fall at Sandown before, this past Saturday, Ruby Walsh broke his leg in what was, remarkably, his third fall of the afternoon. It is of course the very essence of the National Hunt jockeys' existence to face down danger between ten and twenty - and as many as 32 - times per race. In that context, falls are a natural by-product of race outcomes. But what is a reasonable rate for a rider to become separated from his or her equine partner? Below are the faller rates for the last five years in UK/Irish chases by a number of the top jockeys, one notably since retired. 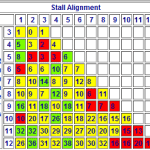 To be clear, this is for steeplechase falls and unseats (FU's) only, and the table is sorted by number of rides. To add more global context to this subset of superstars, the average fall/unseat rate in the last 10,000 starters in UK and Irish chases has been 6.59%. Solely in Irish chases, the last 10,000 starters there fell or unseated at a rate of 7.84%, presumably because of the heavier turf on which they predominantly race (a subject for another, wetter, day). It may then be fair to say that anything lower than that is outperforming the average, and anything higher than that is under-performing against the average. But not all chase rides are 'average'. The likes of Ruby Walsh and Jack Kennedy are more frequently engaged in the kind of skirmishes for victory which may demand firing a horse at the last, or an earlier fence, in a more aggressive fashion than, say, a rider popping round for fourth place. If that is to mitigate, the disparities in the table cannot be so simply swept from view. We can see i the table that, on a large number of rides, many of them with winning chances, Richard Johnson, Sam Twiston-Davies and Noel Fehily have all kept their fall/unseat rate below 6.5%. So too have Paddy Brennan, Barry Geraghty, and the now retired Tony McCoy. But across the Irish Sea, look at Davy Russell, who leads the Irish jumps championship this term, and his hitherto closest pursuer, Ruby Walsh. Note also Jack Kennedy, number one jockey at Gordon Elliott's powerfully ascendant yard. Russell's tumble rate of 7.13% is on the high side compared with Britain, but not wildly out of kilter with the pan-national average and in the green zone against his domestic peer group. The same cannot be said of Jack and Ruby. Although the former is young and arguably still learning his trade - arguably because he's had many more rides than plenty of jockeys five years his senior - the latter especially looks a surprisingly precarious pilot. Now, before the hate mail starts, obviously I recognise that Ruby Walsh is one of the great jockeys of our time and that this is but one barometer of a jockey's ability. But, all the same, if I want to bet at a short price - and his rides are almost exclusively offered at prohibitive odds - I need to know that I have to factor a higher than average likelihood of my selection not passing the post in a chase with the rider on its back. With Jack Kennedy, he's almost 20% more likely to be dumped on the turf than the Irish average. Let me be clear again: this is not about Ruby or Jack or anyone else. I'm far too selfish for that. No, this is about me as a punter knowing what I'm up against. About being forewarned and, therefore, forearmed. Five years is a long time and it makes for some statistically significant (in the context of racing's generally small samples at least) inferences. But how do we compare jockeys with themselves? One way is to look at a snapshot - a subset - of the overall dataset. For punting purposes, the most current subset seems the most sensible. Below then are the last twelve months for the same jockey grouping, again sorted by number of rides. Whilst even more care needs to be taken not to make bold claims on the basis of flimsy sample sizes, there remain elephants in the room. First, let's look at Paddy Brennan, recently relieved of his supporting role atop the gorgeous Cue Card. His 3.85% fall/unseat rate in the past year is comfortably the lowest in the group and almost 1.5 times better than his five year average. Was he thus unlucky to lose such a coveted ride? That depends entirely on whether you're a macro sort of guy or you have the nuanced eye to make decisions based on the specifics of a handful of rides. I certainly don't consider myself qualified in the latter context and can see arguments for and against the rider switch. The British Champion Jockey, Richard Johnson, has seen his tumble rate increase in the past twelve months, though possibly not materially. It has crept above the 10,000 runner average of 6.59% by a tiny margin: Johnson's renewed appetite to forage for every ride will have introduced a greater element of quantity over quality to his diet and the variance may perhaps be explained in such a way. Noel Fehily has been remarkably consistent while Sam Twiston-Davies, who amazingly (to me at least, he seems to have been around for a long time) has only just turned 25, has retained his partnerships on a notably more frequent basis according to the most recent evidence. Tough luck then to break his elbow earlier this month; he actually rode in a subsequent race, attesting to the no-safety-net trapeze swing between heroism and stupidity that many in the weighing room unquestioningly fling themselves. Meanwhile, Ireland's champion jockey-elect, Davy Russell, is 27 winners clear of his nearest challenger if one excludes the sidelined Walsh from calculations. Russell is approaching veteran status, though still in his late thirties, and has courted controversy this year in the manner with which he attempted to correct a recalcitrant mount. That episode deserves no more than a footnote in a piece the focus of which is elsewhere, and it will indeed be a shame if a man shunned by his major employer less than four years ago does not receive the praise he deserves if/when winning the jockeys' championship. Fair play to him. To the elephant or, more precisely, the trio of elephants, in the room. Barry Geraghty first. He is one of the best jockeys I've seen and, in his time at Nicky Henderson's, was a man never to be dismissed. But, since taking the green and gold coin of Team JP, misfortune has followed him like a very bad smell. Since last July, he has broken both arms, in separate incidents; cracked a rib and collapsed a lung on another occasion; and recently (late August) fractured a shoulder blade. You have to be tough to be a jump jockey - far tougher than to look at numbers and write words about the subject - but my admiration starts to wane when riders persist in the face of mounting fragility. It's no more my place to suggest to a rider about when to retire as it is for a rider to enquire on the number of winners I've ridden. So I won't. All I'll say is that I imagine the partners and families of jump jockeys rejoice the news of their loved one's cessation of getting legged up in a similar vein to that of the partners and families of professional boxers on hearing of gloves being hung for the final time. And I sincerely hope BJG has a long, uninterrupted and fruitful spell between now and whenever he pursues alternative employment. Yet still we've to address the figureheads of Closutton and Cullentra, Ruby and Jack. In the last twelve months, Kennedy has come unstuck a dozen times from 123 chase starts. That's as near to ten per cent, and as near to 25% above the Irish average, as doesn't matter. Walsh has fallen or unseated once more than Kennedy, from one more ride, in the same period, a ratio above 10% and almost 33% greater than the norm. It seems churlish to kick a man when he's down - Ruby faces a race against time to be back for the Cheltenham Festival and, like all fans of the sport, I hope he makes it - so I'll let those data speak for themselves. All I will add is that, to my eye - and keep in mind I've never ridden a winner - Ruby takes too many chances with fatigued animals late in races. Mounting (or, cynically, dismounting) evidence seems to support that. The pressure in the Elliott and Mullins camps must be enormous, not just from the trainers, but from owners, other jockeys in the yard and, increasingly, the omnipresence of (social) media. Much of the latter is unworthy of attention, but when you're accustomed to being told how good you are, the sharper brickbats probably leave a weal. There is an inherent selection bias in the tables above. Each of the jockeys therein has earned his place by being at the top of his peer group; such elevation comes only from taking chances when they're presented, and occasionally fashioning them when they may not absolutely be there. As sports gigs go, riding 600kg animals over five foot fences (apologies for mixed metric-phors) around fifteen times per race on average is down there with the worst of 'em. It would never be for a wuss like me. Although not big on machismo either, I have a robust respect for these turf-eating gladiators as a collective. But when the wallet comes out, they are individuals. And I want to know which individuals will support my bottom line, in the same way that these jocks want to know which horses will provide the winners to propel them up the championship table. It's every man (and woman) for themselves. Nobody is more or less selfish than the next, either in the punting or riding ranks; and nor should they be. To that end, the frailties of otherwise tremendous jockeys with enormous (and, in the main, well deserved and hard earned) reputations are power to the contrarian punters' elbow. Ruby has won aboard 30% of the chasers he's ridden in the last five years. That's open water clear of the next best (McCoy 22%, Daryl Jacob and Noel Fehily 20%, Sam T-D and Paddy B 19%, Richard Johnson 18%). But, from a punting perspective, his negative ROI of 18.86% at SP during that time is surpassed by absolutely nobody in his Premier League peer group. Some of that, of course, relates to his stable's form with chasers, most of it to the over-exposure of the Mullins/Walsh/Ricci PR machine; that's neither here nor there in terms of wagering. Meanwhile, on the flip side, the unfashionable Paddy Brennan not only wins at a 19% clip, he's also secured a profit of almost 60 points at SP in the same time frame, regardless of the Cue Card fallout. Backing horses is not a beauty contest, nor is it about fashion. On the contrary, the value lies wherever the spotlight doesn't. And, even in the halogen glare of the media beam, punting pearls are left for those with peripheral vision. Always be asking questions, take nothing on trust. The data is here. Use it. It rarely lies. I genuinely hope Ruby gets back in time for the Festival, and I further hope he has a fantastic time of it. But I'll not be touching his chase mounts there, or pretty much anywhere else. That's unlikely to trouble him, of course. Devil take the hindmost! https://www.geegeez.co.uk/wp-content/uploads/2017/11/rubywalshfallsfrominvitationonly.jpg 319 830 Matt Bisogno https://www.geegeez.co.uk/wp-content/uploads/2018/09/geegeez_banner_new_300x100.png Matt Bisogno2017-11-20 15:03:532017-11-20 21:32:00Jump Jockeys: How Are The Mighty Fallen? The star of tomorrow became the King for a day, as Thistlecrack stormed to a hugely impressive victory in the King George at Kempton. It proved to be a dominant display from Colin Tizzard’s young chaser, despite concerns that the sharp track would prove less than ideal. In truth, the result never looked in doubt. Tom Scudamore sent Thistlecrack to the front from the off, and though he had company for the first circuit, he appeared capable of stretching clear whenever asked to do so. His jumping was assured throughout, and despite the step-up in class, he tanked along in his now customary superlative fashion. Paddy Brennan moved Cue Card alongside his stablemate, in an attempt to apply some sort of pressure. But as the pair approached the home turn for the final time it was Thistlecrack that stepped on the gas and stretched clear. No more than nudged out by Scudamore, he was allowed to run down the last two fences, and still finished more than three lengths clear at the line. Cue Card held on to second spot in a blanket finish for minor honours. Unfortunately for Cue Card and the rest, ground conditions appear to have little effect on this sensational racehorse. And the way he trounced the opposition in last year’s World Hurdle suggests he’ll actually be better suited by Cheltenham. A practice spin in the Cotswold Chase at the end of January now appears likely. King for a day at Kempton, chances are that Thistlecrack will reign for some time to come. Cue Card romped to his third success in the Betfair Chase, endorsing his status as the best staying chaser in the business. The eagerly anticipated clash with 2015 Gold Cup winner Coneygree came to fruition, with the pair at the head of affairs throughout, before stretching clear turning for home. Over the fourth last fence, Paddy Brennan allowed Cue Card to stride on, and although Coneygree battled bravely, he was unable to live with a power-packed performance from Tizzard’s star. Kept up to his work, the winner was 15 lengths clear at the line, with Brennan punching the air in delight. Brennan was ecstatic with the success. He’s fully aware of his good fortune to be partnering such a horse, and appreciative of the opportunity. And you can be sure that nothing would thrill him more than another crack at the Gold Cup, and the chance of putting to bed the memory of last year’s third last fence disaster. The Bradstocks were equally thrilled with the comeback performance of Coneygree. Off the track for just over a year, he was sent to the front by Richard Johnson, and jumped with all his old exuberance. Foot perfect throughout, it came as no surprise when he appeared to weaken down the home straight. Cue Card was certainly much the superior horse on the day. Whether that proves to be the case next time, when both are match fit, remains to be seen. There’s every chance that the pair will meet again in the King George, with Sara Bradstock hinting at Kempton being the likely next step. She was pretty bullish in her assessment of the race, when saying: “To see him run like that and wanting to go, we couldn’t have asked for any more. You have to remember there’s been no soft ground to train him on. For the other horses who are race-fit it’s different, but he is not just coming back after a year but coming back on a surface he’s not ready for. The pair head the market for the Christmas showpiece, and ‘Cue Card versus Coneygree - The Sequel’ is a mouth-watering proposition. In the last 30 days, trainer Fergal O'Brien's runners are 8/25 (325 SR) for 54.6pts (+218.4% ROI), from which today's jockey Paddy Brennan is 6 from 17 (35.3%) for 43pts (+253%) and the O'Brien chasers are 3/10 (30%) for 15.3pts (+153%). Jockey Paddy Brennan is riding well independently too with 11 winners from36 (30.6% SR) for 58.4pts (+162.1% ROI) over the last month with 5 wins from 22 (22.7%) over fences generating level stakes profits of 10.24pts at a return of 46.5%. In addition to the above, I'm mildly intrigued at Fergal sending this horse on a 700-mile round trip today, when Exeter also has racing and is a 250-mile round trip from the O'Brien yard in Gloucestershire, so I did a litle digging and I found that since 2012 in winter (Oct-Mar) NH races, Fergal o'briens runners making a round trip of 450 miles or more won 5 of 24 races (20.8% SR) for 4.23pts (+17.6% ROI) profit. With 19 winners already this autumn at a promising strike rate of 17%, Fergal O’Brien continues to build a stronger looking team at his Naunton yard. O’Brien has amassed a wealth of racing experience over the years, having left his native Ireland at the age of 16. He has worked for renowned trainers of the stature of Ginger McCain and Captain Tim Forster, but is best known for his lengthy spell as assistant to Nigel Twiston-Davies. He spent a ‘mind-blowing’ 18 years in the company of NTD, and during that period the stable won a Gold Cup and two Grand Nationals. O’Brien also spent eight years training point to pointers, with huge success. He topped the West Midlands Pointing Trainers’ Table on four occasions. When finally taking the plunge and going it alone, O'Brien set up camp at Fossebridge, near Cirencester. This was his training base for three years, but it seems he was unable to stay away from his old boss, and decided to move-in next door. Now at Upper Yard, Grange Hill Farm, surrounded by stunning Cotswold countryside, and a few furlongs from a famous watering hole in the Hollow Bottom, O’Brien is more than prepared for a successful winter campaign. The yard boasts 42 newly refurbished stables, with further facilities including all-weather gallops, a horse walker and an equine swimming pool. O’Brien has the backing of several well-known owners, including Mr and Mrs Rucker (of State of Play and Alvarado fame), Paul and Clare Rooney and the Imperial Racing Partnership (Imperial Commander’s gang). O’Brien strongly promotes ‘inclusion for all’ in a sport he loves. The Fergal O’Brien Winter Racing Club is a terrific way for people to get a taste for racing at a reasonable outlay. The club are represented by a number of horses and a greyhound, with an emphasis on learning about the sport in a wonderfully sociable environment. As with all fledgling trainers, one of O’Brien’s major aims over the coming years will be to improve the quality of horses in the yard and to win high profile events. Barney Dwan looked a gelding with a bright future, when staying on powerfully to win the valuable novices’ handicap hurdle at Sandown in March. Owned by the Rooney’s, he is now three from six over hurdles, and should make a decent staying chaser. By Vinnie Roe, he appears to cope well with testing conditions. I’m Still Waiting and Pemba are also owned by Paul and Clare Rooney. The former is nicely bred, and starts his career at Worcester this afternoon. The latter will have needed her comeback run at Market Rasen, but had decent form as a juvenile last winter, and should be capable of winning more races over hurdles. Colin’s Sister looked a mare to get excited about, when winning well at Chepstow recently. She’s a huge horse, and may take time to strengthen, before going on to make a decent chaser in time. Another exciting youngster who stormed to victory at Chepstow, is the Winter Racing Club’s Poetic Rhythm. The five-year-old son of Flemensfirth still looked babyish at times, but showed a great attitude in pulling well clear to win the bumper by seven lengths. Paddy Brennan was clearly thrilled with his mount, who still looked full of running at the post. Fergal O’Brien and his team will be hoping that these youngsters can provide a bright future for his Naunton yard. Early signs are certainly promising. With the Grand National being covered extensively by the boss, I decided in today’s piece to turn my attention to the exceptional talent that is Cue Card. His performance in the Betfred Bowl Chase was truly stunning, and at the age of 10 he has become one of the most popular horses in training. The Willie Mullins pair of Djakadam and Don Poli did their utmost to run the sting out of Tizzard’s star, but Paddy Brennan had all angles covered and when he asked Cue Card to turn on the turbo’ at the third last, the response was devastating. He swept clear to win by nine lengths, with Don Poli battling on for second. It’s clear that whilst Cue Card is in rude health his trainer is keen to allow him to run. There’s been periods during his career when that was simply not possible. Breathing issues, pulled muscles and a stress fracture of his pelvis, are just some of the ailments that have laid him low over the years. However, when on the track, fit and well, he has proven to be an outstanding racehorse. He exploded onto the scene as a four-year-old in 2010 when romping to victory in the Champion Bumper at Cheltenham. He was sent off a 40/1 outsider and had Al Ferof eight lengths back in second. That stunning success ensured that he entered his first season over hurdles as one of the leading novices, with many anticipating a bold show in the Supreme Novices’ Hurdle back at the Cheltenham Festival. He was duly installed as race favourite, but in a stellar renewal could only manage fourth behind Al Ferof, Spirit Son and Sprinter Sacre. He was campaigned over the minimum trip for much of his novice chase year, culminating in a second place finish in the Arkle behind the exceptional Sprinter Sacre. He finished seven lengths adrift that day, a performance that can now be reflected upon with great pride. The 2012-13 campaign saw him step-up in trip, after initially winning the Haldon Gold Cup at Exeter. Still only a six-year-old, he was sent to Kempton to contest the King George, but failed to spark under ‘hold-up’ tactics in testing ground. He bounced back to form in the Ascot Chase when thrashing Captain Chris; a horse that had finished well ahead of him in the King George just a month or so earlier. The Ryanair Chase at Cheltenham became the logical target after such an impressive win over 2m5f at Ascot, and that decision was justified when Cue Card ran out an impressive winner by a yawning nine lengths. That victory set up a clash with Sprinter Sacre at Aintree in the Grade 1 Melling Chase, a race that will live long in the memory, and a race that he probably failed to get due recognition, as it was probably one of his greatest performances. It was Sprinter Sacre that received the accolades for his stunning victory at Aintree, in a truly dazzling display, yet for Cue Card to get within five lengths that day is testament to just how exceptional he is. The two pulled 20 lengths clear of Flemenstar and Finian’s Rainbow. It was an outstanding display by both horses. 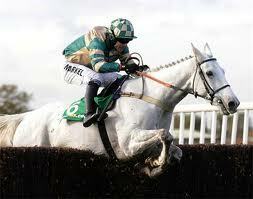 The following winter saw him campaigned as a staying chaser. He took the Betfair Chase at Haydock, running away from Dynaste and Silviniaco Conti, giving hope that another crack at the King George would prove successful. Kempton’s showpiece looked sure to go his way until he appeared to run out of gas late on, with Silviniaco profiting. A spell on the side-lines prevented him from running at Cheltenham in 2014 and when he returned for the 2014/15 season he looked a shadow of his former self. Tizzard discovered the reason for the loss of form when the horse was found to have a trapped epiglottis. The successful operation has allowed the horse to see out the extended trips and has resulted in a truly incredible winter for both horse and trainer. Victory in the Charlie Hall Chase was followed by success at Haydock in the Betfair and then, rather ironically, a last gasp victory in a thrilling King George. No-one knows what would have happened at Cheltenham had he stood up, but one thing we do know is that Cue Card is now undoubtedly an outstanding staying chaser. He’s always been a terrific racehorse, but for much of his career failed to get the credit he probably deserved. During this winter he has been physically able to give his best, and that best has proved to be something very special indeed. This 7yr old gelding is in excellent form, finishing 112 in his last three outings and only narrowly (0.75 lengths) failed to compete his hat-trick last time out despite conceding 20lbs (inc a 5lb jockey claim) to the useful Anthony Honeyball runner As de Fer. Quite by Chance might well only be 4 from 25 to date, but that doesn't tell the whole story about a horse who is 4/15 in handicap chases with all four wins coming from 10 efforts going right handed and 4 from 10 is much better on the eye! Of that 4 from 10 record, he is 3 from 6 (21P112) here at Wincanton, 3 from 5 in fields of 8/9 runners (3 from 3 here! ), he's 2 from 3 on soft ground and has one win and one runner-up finish over this track and trip, so conditions look perfect here for him. And if 21 is a small sample, the secondary stat comes from an original dataset of a mere 3630 runners! As that's how many times a Midnight Legend offspring has hit the track! Regular readers will know of my fondness of this sire, as backing his progeny produces profits. If you'd backed every Midnight Legend runner since the start of 2008, you'd have celebrated 459 winners from 3202 bets at a strike rate better than 1-in-7 (14.33% SR). Another thrilling weekend brought success for the past, present and future of National Hunt racing. 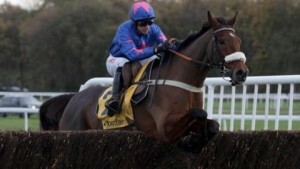 At Haydock it was Colin Tizzard’s wonderful chaser Cue Card that again stole the show. He added the Betfair Chase to his Charlie Hall success achieved three weeks earlier, as he continues his incredible return to the Premier League of staying chasers. The style of victory was as startling as the achievement itself. The nine-year-old cruised through the race before moving alongside Silviniaco Conti four fences from home. Paddy Brennan hardly moved a muscle on top, as his horse swept to the front, pulling clear for a ‘hard-held’ seven length winning margin. It’s hard to imagine Silviniaco Conti turning the tables on a rejuvenated Cue Card at Kempton, although as a guest on the Morning Line earlier, Nicholls had hinted that another couple of week’s preparation would have been ideal to have his charge 100% for the Haydock race. This being the case, it may be unwise to completely rule out the duel King George winner. Whilst Cue Card was confirming his status as this winter’s ‘Golden Oldie’, down at Ascot Vautour was opening his account at senior level. His novice chase campaign was simply sensational and his return had been eagerly anticipated. The Stella Artois 1965 Chase appeared a perfect starting point with the King George in mind, but he was made to work for his win by another classy sort in Ptit Zig. Jumping slightly out to his left on occasion, Vautour was nevertheless impressive, only making one noticeable error when stepping at a fence midway down the back straight. Ptit Zig came close to causing a major upset, and may well have another crack at the Mullins star over Christmas. Part-owner Barry Fulton initially appeared indifferent to a possible re-match in Kempton's Christmas showpiece, but after sleeping on the matter seemed rather more enthusiastic on Sunday morning. With Silviniaco having disappointed slightly in the Betfair Chase you can be pretty sure that Nicholls will be eager to throw another top-class chaser at the King George. Still only six, Ptit Zig has looked his best with plenty of juice in the ground and would surely be a major player if he took his chance at Christmas. Team Skelton were at it again at Cheltenham on Wednesday afternoon as Long House Hall absolutely hosed up to win by 16 lengths without even having to be ridden. He'd been turned out quickly ahead of a hike in the weights, which is now likely to be massive, so don't be surprised if he doesn't run again within the next few days. He was even a bit keen early on and had to be restrained, so might still have more to come over a longer trip, but that's not for me to call. All I can say is that it's another 3.5pts in the bag as this purple patch continues with the added satisfaction of beating SP by half a point. Where I'm backing A Good Skin at 9/2 with Stan James (please note, SJ are non-BOG until 10.00am, but I think this will shorten & 4/1 BOG is widely available), as the horse bids to win back to back chases in the space of a fortnight. He's trained by Tom George, whose record in handicap chases since the start of 2011 with horses priced in the 2/1 to 8/1 range reads 70 winners from 354 runners with the 19.8% strike rate giving rise to level stakes profits of 69pts at an ROI of 19.5%. When today's jockey Paddy Brennan is in the saddle, however, the results are even better. 56 winners from 247 represents a 22.7% strike rate and the 83.2pts profits are 33.7% return on your money, which is hardly surprising as the team are profitable to back blindly over fences. Since 2010 the George/Brennan/Handicap Chase equation looks like this at all odds : 84/442 (19.9% SR) for 47.33pts (+11.22% ROI), which is nice little thing to keep an eye out for. They excel at Classes 3 & 4, they do really well around this type of trip, but more importantly, they just make money! I said at the top of the piece that A Good Skin was a winner a fortnight ago: that was at Ludlow, when he beat Loose Chips by three parts of a length, but don't be fooled into thinking that was a hard race to win for him. He hit the last fence quite hard when 4 to 5 lengths clear, lost his momentum and idled on the run in and was still able to repel the challenger. A step up in trip and something to challenger him should bring more out of him today. And then there's the knowledge that since 2008, Tom George's handicap chasers who won their last race in the previous 30 days went on to win again on 18 of 79 (22.8% SR) occasions for level stakes profits of 13.4pts (+16.9% ROI), so there's another tactic to look out for. Those such runners who ran at odds of 6/4 to 7/1 won 15 of 58 (25.9% SR) for 17.3pts (+29.8% ROI), while Paddy Brennan rode 15 winners from 51 (29.4% SR) for 21pts (+41.2% SR) and when Paddy was riding a 6/4 to 7/1 shot, he was successful 14 times from just 40 efforts, a fantastic 35% strike rate yielding 29.8pts profit at an ROI of 74.4%. The George/Brennan alliance is in good nick, landing a couple of winners last week before a narrow defeat with Saint Are finishing runner-up in the Grand National and they had a 6/1 success here at Cheltenham on Wednesday with their only runner of the day, Whats Happening. Stan James are currently best priced at 9/2, but that won't go BOG until 10.00am, but I'm taking that now, because I think A Good Skin will contract in the market, but if you want/need the BOG security, 4/1 BOG is readily available and I'll be using that for official results. Another frustrating blank yesterday, as Frisco Depot seemed not to stay the trip and folded quite tamely late on. He still got home, albeit in 5th position. The money came for David Pipe's favourite and his horse justified the support winning quite comfortably. Tom George has a good record with his runners here at Kempton over the last couple of years: 15 runners, 4 winners (26.7%) for 10pts profit (+66.7% POI) with a further two runners making the frame. His chasers here have kept up their end of the bargain too with three winners from nine (+11pts) and a place strike rate of 56%. Paddy Brennan is one of the top jockeys around this course during the same time-frame too, with stats of seven winners from twenty for good profits of 30pts at SP and a 45% place strike rate. His record when chasing here is four winners and a place from just 10 attempts: the 4 winners producing 20pts profit to boot. Together, they have already made 34pts profit this season at various tracks, whilst in 2012 they teamed up six times here at Kempton with a record that reads 11F161 giving followers 18.5pts profit (21.4pts for the E/W backers), whilst their 2012 Kempton chase form was 1161 for 15.5pts (18.6pts E/W). Paddy rides two chasers for Mr George today: Lexicon Lad looks to have a reasonable chance in the 1.30 race, but for a horse more likely to place than win, his current odds of around 9/2 are a little on the mean side for me with no E/W get out. Instead I'm more interested in the grey Nacarat running in the 3.50 race. Nacarat is 1424351 over course & distance giving returns of 9.5pts for win backers and 12.75pts to E/W stakes, so this 12 yr old warrior has been profitable to follow here. He also loves this race, having finished in the first three home in each of the last four renewals. He won the race in 2009, 2nd in 2010, 3rd in 2011 and he won it again last year, beating Hector's Choice (who subsequently went on to win at Cheltenham) by some eleven lengths. Nacarat arrives here just 1lb higher than that win last year and I expect another strong show from the front today. ...you can view today's racecard here.